Jewelry store announces the addition of the Tango collection to their Black Hills Gold products that are built from legend and styled for today combining affordability with elegance. So, if it is a special occasion like a wedding or an anniversary or you wanted to buy your significant other or your parent, sibling or friend a small gift to show your love and appreciation you are sure to find something easily that fits your budget. BuyBlackHillsGold.com, one of the best-known online stores for selling Black Hills Gold jewelry today announced the addition of the Tango line to their wide assortment of products. Based on the legend, traditional Black Hills Gold jewelry features rose colored and green colored leaves and gold grapes and grapevines integrated into each piece of jewelry resulting in a tri-color motif of green, rose and yellow gold. The Tango collection features bold pieces of 10K gold entangled completely with dazzling sterling silver designs to create an attractive style of affordable jewelry. The gold pieces and silver designs are so closely intertwined that they result in a bold twist of color to traditional jewelry while still retaining the charm of a key symbol of true American tradition. BuyBlackHillsGold.com sells everything from Black Hills Gold rings to pendants, earrings, watches, lockets, bracelets, wedding sets, toe rings and anklets. The Tango product line adds to the assortment that customers will find attractive in the current economic situation. The web site has something in it for every one and fits budgets of all sizes. 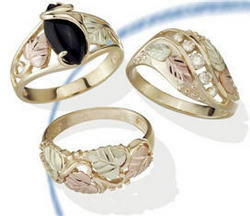 It features Black Hills Gold Jewelry by Coleman which was founded in 1977 and is known as the world's largest producer and supplier with a large assortment of Black Hills Gold Jewelry designs at outstanding prices. According to Coleman, the Tango collection was created knowing that affordable Black Hills Gold jewelry was very important in this holiday season. While expanding their product portfolio, BuyBlackHillsGold also introduced an aggressive Holiday sale with a 25-40% reduction in prices storewide. "While change is in the air, we also recognize this is troubled economic times and so we made it easier for people to shop for gifts based on price points." says Parija who is the co-owner and founder. "So, if it is a special occasion like a wedding or an anniversary or you wanted to buy your significant other or your parent, sibling or friend a small gift to show your love and appreciation you are sure to find something easily that fits your budget." Parija adds "We have had a lot of customers tell us about the assortment of products we carry as well as the reaction it brings out from the recipient. That - to me is always priceless. The Tango collection has brought in an enthusiastic response from those customers who want top-value for their money as well as want to own a piece of tradition. This was a natural choice to take our product offering to the next level." The response to their site has been so tremendous, that a second web site selling gemstone jewelry has been launched to commemorate the anniversary of opening BuyBlackHillsGold.com. BuyBlackHillsGold.com has a huge Selection of Black Hills Gold Jewelry, at reasonable prices. It offers a wide range of selections that include couples jewelry, anniversary rings, bridal sets and inspirational jewelry that create a one-of-a-kind experience.